Bone marrow contains hematopoetic stem cells, the precursors to every blood cell type. These cells spring into action following bone marrow transplants, bone marrow injury and during systemic infection, creating new blood cells, including immune cells, in a process known as hematopoiesis. A new study led by University of Pennsylvania and Technical University of Dresden scientists has identified an important regulator of this process, a protein called Del-1. Targeting it, the researchers noted, could be an effective way to improve stem cell transplants for both donors and recipients. There may also be ways to modulate levels of Del-1 in patients with certain blood cancers to enhance immune cell production. The findings are reported this week in The Journal of Clinical Investigation. "Because the hematopoetic stem cell niche is so important for the creation of bone marrow and blood cells and because Del-1 is a soluble protein and is easily manipulated, one can see that it could be a target in many potential applications," said George Hajishengallis, the Thomas W. Evans Centennial Professor in the Department of Microbiology in Penn's School of Dental Medicine and a senior author on the work. "I think that Del-1 represents a major regulator of the hematopoetic stem cell niche," said Triantafyllos Chavakis, co-senior author on the study and a professor at the Technical University of Dresden. "It will be worthwhile to study its expression in the context of hematopoetic malignancy." For Hajishengallis, the route to studying Del-1 in the bone marrow began in his field of dental medicine. Working with Chavakis, he had identified Del-1 as a potential drug target for gum disease after finding that it prevents inflammatory cells from moving into the gums. Both scientists and their labs had discovered that Del-1 was also expressed in the bone marrow and began following up to see what its function was there. "In the beginning, I thought it would have a simple function, like regulating the exit of mature leukocytes [white blood cells] from the marrow into the periphery," Hajishengallis said, "something analogous to what it was doing in the gingiva. But it turned out it had a much more important and global role than what I had imagined." The researchers' investigations revealed that Del-1 was expressed by at least three cell types in the bone marrow that support hematopoetic stem cells: endothelial cells, CAR cells and osteoblasts. Using mice deficient in Del-1, they found that the protein promotes proliferation and differentiation of hematopoetic stem cells, sending more of these progenitor cells down a path toward becoming myeloid cells, such as macrophages and neutrophils, rather than lymphocytes, such as T cells and B cells. 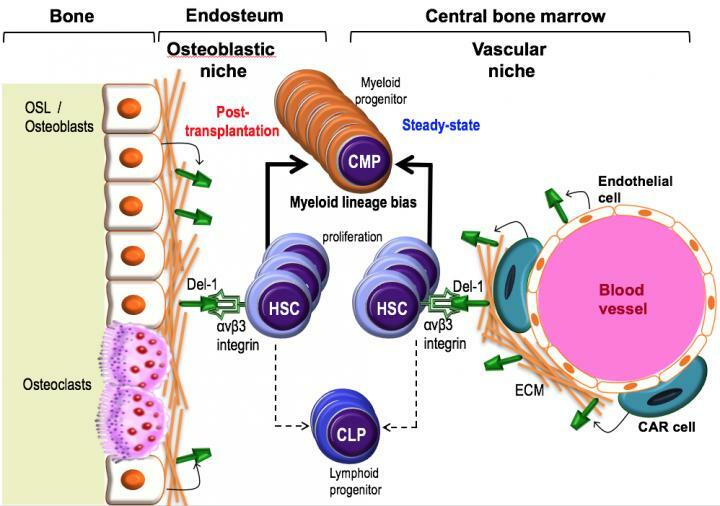 In bone marrow transplant experiments, the team discovered that the presence of Del-1 in recipient bone marrow is required for the transplanted stem cells to engraft in the recipient and to facilitate the process of myelopoesis, the production of myeloid cells. When the researchers mimicked a systemic infection in mice, animals deficient in Del-1 were slower to begin making myeloid cells again compared to those with normal Del-1 levels. "We saw roles for Del-1 in both steady state and emergency conditions," Hajishengallis said. Hajishengallis, Chavakis and their colleagues identified the protein on hematopoetic stem cells with which Del-1 interacts, the ß3 integrin, perhaps pointing to a target for therapeutic interventions down the line. The scientists see potential applications in bone marrow and stem cell transplants, for both donors and recipients. In donors, blocking the interaction between Del-1 and hematopoetic stem cells could enhance the mobilization of those progenitors into the bloodstream. This could be helpful for increasing donor cell numbers for transplantation. Transplant recipients, on the other hand, may need enhanced Del-1 interaction to ensure the transplanted cells engraft and begin making new blood cells more rapidly. In addition, people undergoing chemotherapy who develop febrile neutropenia, associated with low levels of white blood cells, might benefit from the role of Del-1 in supporting the production of immune-related blood cells such as neutrophils. "It's easy to think of practical applications for these findings," said Hajishengallis. "Now we need to find out whether it works in practice, so our studies continue." Ioannis Mitroulis, Lan-Sun Chen and Rashim Pal Singh of TU-Dresden were co-lead authors on the study, and Ben Wielockx of TU-Dresden was a co-senior author along with Hajishengallis and Chavakis. They were joined by coauthors Tetsuhiro Kajikawa, Kavita Hosur, Tomoki Maekawa and Baomei Wang of Penn Dental Medicine; Ioannis Kourtzelis, Matina Economopoulou, Maria Troullinaki, Athanasios Ziogas, Klara Ruppova, Pallavi Subramanian, Panayotis Verginis, Malte Wobus, Martin Bornhäuser and Tatyana Grinenko of TU-Dresden; Torsten Tonn of the German Red Cross Blood Donation Service in Dresden; and Marianna Di Scala and Andrés Hidalgo of the Spanish National Center for Cardiovascular Research. The study was supported by the Deutsche Forschungsgemeinschaft, European Commission, European Research Council and National Institutes of Health (grants AI068730, DE024153, DE024716, DE0152 54 and DE026152).